On most days, Danielle Benoit can be found in her lab developing better ways to administer medicines for treating diseases, particularly childhood cancer. This weekend, Benoit and the other researchers in her lab will show their support for the foundation that helps fund their research. They’ll put down their beakers and syringes in favor of pitchers of lemonade—in the spirit of the little girl who made it all possible. The 4th Annual Benoit Laboratory Lemonade Stand takes place this weekend at the Rochester and Brighton public markets. Benoit, assistant professor of biomedical engineering, and her fellow researchers will be serving lemonade and explaining their work on childhood cancer therapies. 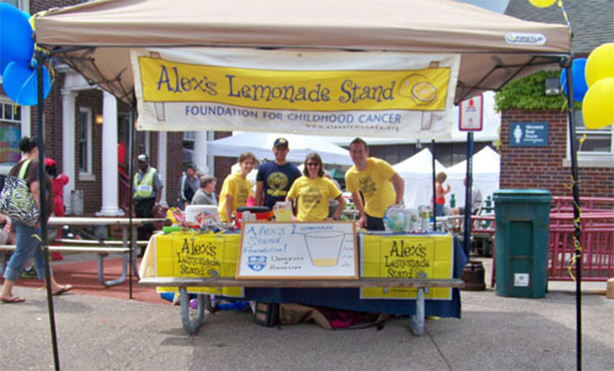 It’s part of a national effort organized by Alex’s Lemonade Stand Foundation. The name comes from Alexandra “Alex” Scott of Connecticut, a four-year-old girl who was diagnosed with cancer before her first birthday. She set up lemonade stands every year before her death at age 8 to raise money so that doctors could find a cure for cancer. The idea spread, and children in other parts of the country set up their own lemonade stands to join the cause. “Cancer affects children differently than it does adults,” said Benoit. “The causes are unknown and the treatments are less-than-optimal since they were developed for adults.” Cancer is also the leading cause of death for children 15 and younger.